For me, the inaugural Dartford parkrun event meant a 7am rendezvous with the event director, Richey, at the library entrance of the park to start marking out the course. I had been awake since 3am with pre-inaugural butterflies, so it was no surprise that I arrived early. Upon arrival I spotted a chap asleep on a park bench wearing a hi-vis jacket. My first thought was that Richey may have had a late night out on the town and decided that to sleep in the park would be the safest option. However it wasn't him and I ran laps of the library while I waited for him. It wasn't long before Richey appeared and we got to work laying the course out. First we looked at the formal garden area - the feedback from the trial run in this section had been good so we stuck with the signage positioning that we had used previously. We then headed round the park and placed the rest of the signage, including working out a new signage set up at the end of 'Mick Jagger's leg'. before heading towards the Dartford Harriers clubhouse to await our volunteers and runners. By the time we got there, there were a few people waiting. Volunteers arrived and Richey and Tessa briefed and dispatched them to their various marshaling points around the course. Still more people continued to arrive and before we knew it, it was 8.50 and almost time to start the pre-run briefing. 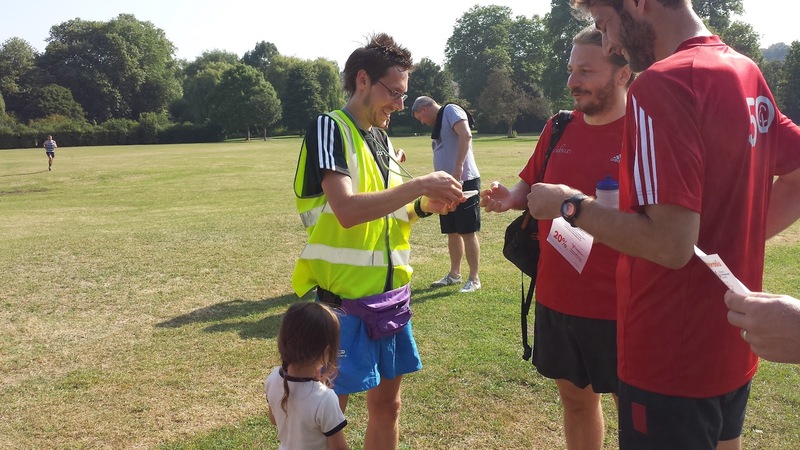 Richey briefed the runners in the usual parkrun manner, he then handed over to the leader of Dartford council, Jeremy Kite. He gave an amusing speech and then we lined up between the two trees for the start of the run. At 9am sharp the run was started. It was a glorious morning and the park looked stunning. If anything it was probably a little too hot for running, but off we all went around the 5km course. 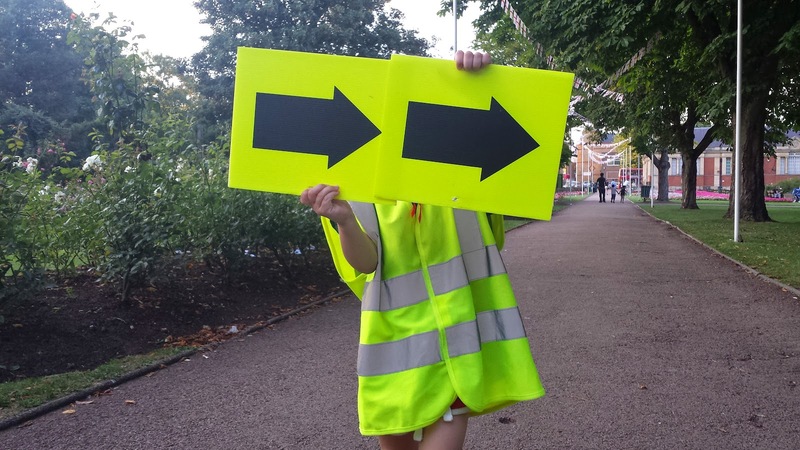 The marshals and course signage combined resulted in all runners successfully negotiating the course (at least, I didn't hear of anyone taking a wrong turn). The problem we had at the trial run where two runners missed the turn around point at the end of 'Mick Jagger's Leg' did not resurface thanks to the addition of a couple of signs, which allowed the marshals (my wife and daughter) to position themselves in the perfect place. For the full course description. 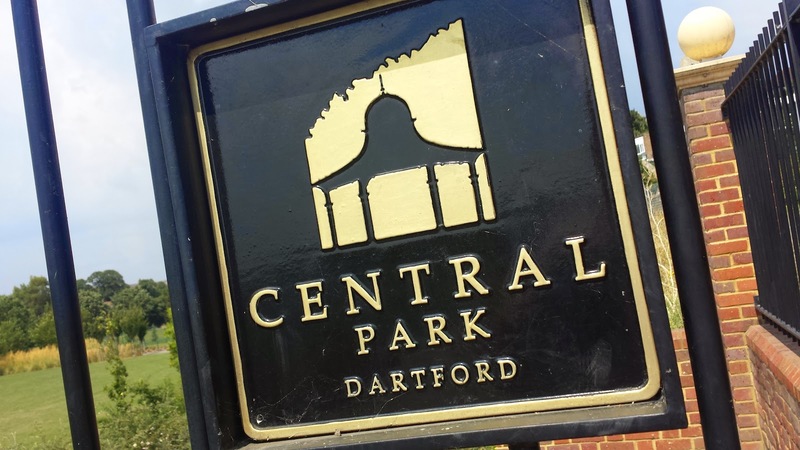 please read the official course page, or if you want more detail and photos, read my Dartford parkrun course description blog. Due to the fact that I can make it around the course reasonably near the front of the pack, I can combine running and barcode scanning at the same event. I made it around in 19.08, slipped on my volunteering vest and donned the barcode scanning device. Slowly the runners came through the finish funnel and a queue formed for the two barcode scanners on duty (me and Tessa). At first, I found the scanner did not want to easily scan the barcodes. Maybe it was the bright sunlight or maybe it just needed to warm up. Anyway, after about 10 minutes it really seemed to get going. The runners kept coming and we kept scanning. Eventually, the queue tailed off and the scanning was complete. Afterwards there were photographs and lots of great feedback. 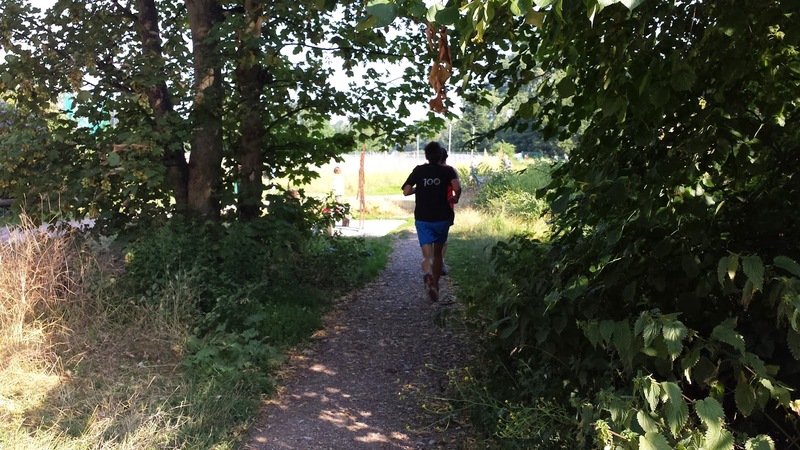 The parkrun tourists that had come along for event 1 have lots of experience of inaugural events and have visited hundreds of different venues between them, so to hear that many of them had good feedback for us was good news indeed. Comments mostly contained words along the lines of 'beautiful' and 'very well organised'. There were a couple of suggestions for improvement, so they have been taken on board. As time ticked away and the runners headed into the Dartford Harriers clubhouse, the park cafe, or indeed somewhere else. It was now time for us to head into the clubhouse and get those results processed. Richey and Tessa set to work on the processing, but due to a problem with the laptop, the information from the stopwatches could not be transferred onto the laptop... So they had to enter everybody's times manually. We had a turnout of 231 runners so this was a mammoth task. Eventually it was complete and the results were sent off the parkrun HQ. It had been an amazing and hectic morning. As I've said so many times before about different events - now that the inaugural is out of the way, it is now time to start building the community. Thankfully the running community in Dartford is already quite well established and hopefully Dartford parkrun will be an integral part of it. There's so much more that happened and so many people I saw and/or chatted to that I haven't even got close to mentioning here. My head is still a blur and to cover everything would mean writing an epic blog, which sadly I do not have enough time to do. To finish up, and I've mentioned it elsewhere, but thank you to everyone who has been involved in getting us to this point. 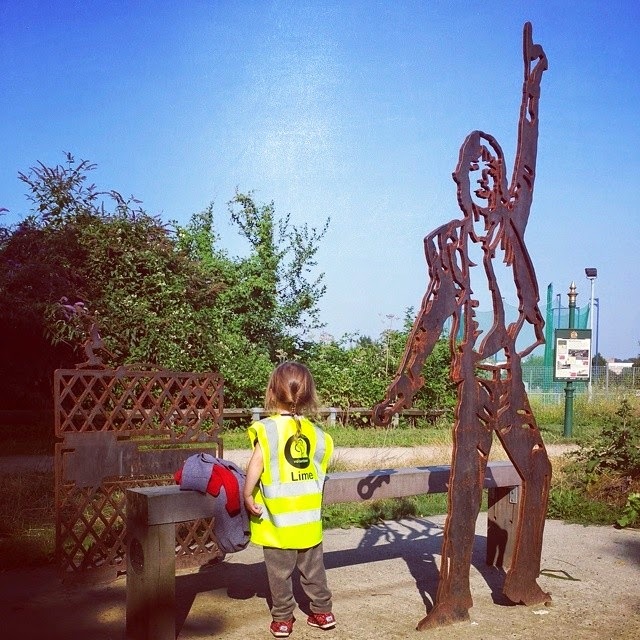 Dartford parkrun has most definitely landed!